My girlfriend Sara from Monterey gave me this bike carrier...so this morning we tried it out! What a trip-Boston loved it! This is my cousin Tyler, he got me my job as a Gardner at the Mesa AZ temple. He hung out with Boston all day on Thanksgiving! THANK YOU!!! So I left Phil for Thanksgiving again. Last time i go anywhere with out him though I promised him. 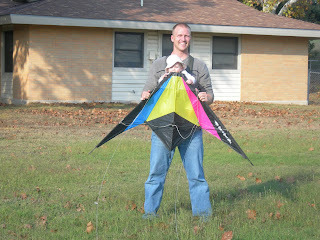 I flew home and before we left we tried to fly my kite. The wind never did pick up, but we had a blast trying! It was so great to see you at the temple! U look great. Your little baby is getting so big, and dang cute!! Isn't it fun! 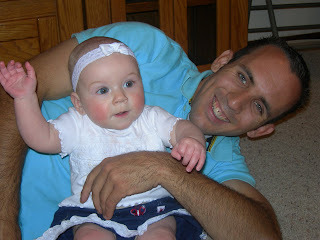 Just wait until she starts crawling and getting into everything...she will keep you on your toes! Boston is so cute! I loved the first pic of her! I wish we lived closer! It would be so fun to see you!!! She is getting so big! How fun. Hope you had a Happy Thanksgiving even though I'm sure it was hard being away from Phil. 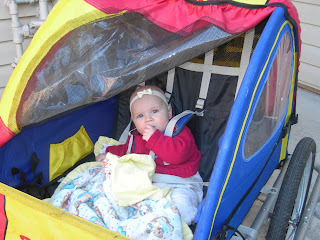 I've been curious about those burley's... looks like she enjoyed it though! I know what you mean about leaving without your hubby, its just not the same unless your together, and did I meantion you have the cutest little girl!! Wow Boston is so big now, I love it, that is awsome your friend gave you that stoller, I bet Boston enjoyed that, it looks fun!